The traction performance of a tire is important to the safety of a vehicle. Traction models of a tire have been proposed for different road conditions, such as dry, wet, snowy, icy and muddy conditions. 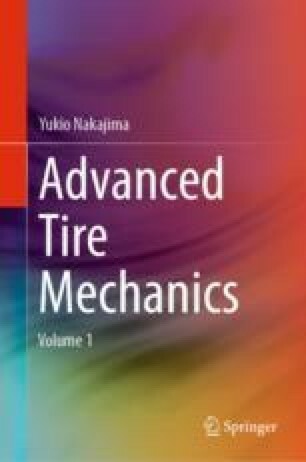 Simple analytical models for tire traction in braking and driving have been developed by extending the Fiala model of cornering performance. One is a model where the contact pressure distribution does not change under braking and driving forces and the sliding point between the adhesion and sliding regions can be determined using a simple equation. Another is a model where the contact pressure distribution changes under braking and driving forces and the sliding point between adhesion and sliding regions can be determined by iterative calculation. The hydroplaning phenomenon is analyzed employing the equilibrium of the hydrodynamic pressure and tire load, the two-dimensional Reynolds equation for squeezing water out of the tread block and computational fluid dynamics (CFD) simulation where a tire is modeled by FEA and water is modeled using the finite volume method (FVM). The snow reaction is analyzed using an analytical model where the shear strength of snow is determined from the density of snow and conducting CFD simulation in an approach similar to that adopted for hydroplaning. The traction on ice is analyzed using a brush model with a friction model on ice where the friction coefficient is a function of the sliding velocity and other parameters of thermodynamics, and another brush model where the shear force distribution of a freely rolling tire is included. The traction on mud is analyzed using an analytical model where the tire deformation is classified as being in a rigid mode or elastic mode according to the difference between tire rigidity and load retention properties of mud, and CFD simulation is conducted in a manner similar to that adopted for hydroplaning. FEA has recently become popular in the design of the tire pattern for traction on wet, snowy and muddy road conditions. where μadhesion is the friction coefficient related to the adhesive force, μhysteresis is the friction coefficient related to the hysteresis force, C1 and C2 are constants, K is the shear stress of the interface, p is the contact pressure, tan δ is the loss tangent of rubber, E´ is the storage Young’s modulus of rubber, and r is a constant with a value less than 1 discussed in Sect. 7.4. Referring to Eq. ( 7.138), Hertz theory gives the relation r = 1/3. Referring to Eq. (12.9), CFs is given by CFs = Cxbl2/2. If the pressure distribution is expressed by a parabola, the maximum pressure pm is equal to 1.5 times the average pressure pav (pm = 1.5pav). Owing to the bending rigidity of tires, the average pressure pav will be larger than the inflation pressure pa (pav > p). The boundary conditions of real tires are expressed as u ≈ v at the tire shoulder and u = 0, v ≠ 0 at the tire center. Hence, Eq. (12.64) may not be satisfied in a tire. The Mohr–Coulomb failure criterion can be determined in shear tests for various normal stresses σ. The Mohr–Coulomb failure criterion is that when Mohr circle comes into contact with the line of Eq. (12.99), with plastic deformation occurring at this point. Suppose that the Mohr circle comes into contact with the Mohr–Coulomb failure criterion at point A of Fig. 12.114a and the angle between the σ-axis and the line connecting point A with the center of the Mohr circle is 2θ (where the counterclockwise direction is positive). A(σ, τ) in Fig. 12.114a expresses the stress field in the coordinate system at angle θ (clockwise direction) measured from the direction of the maximum stress σ1. 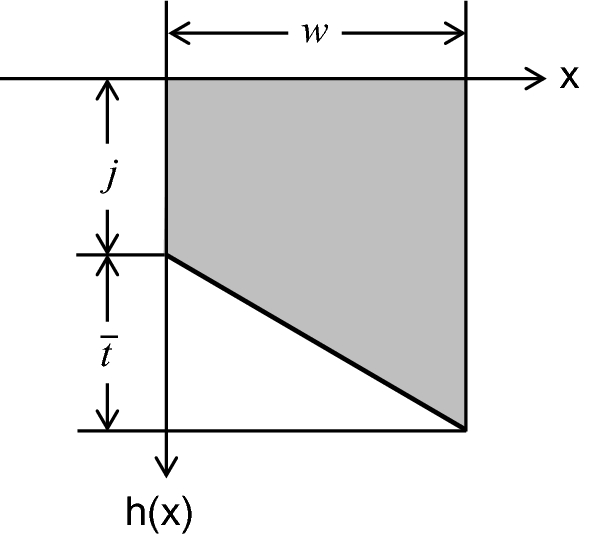 Hence, the shear stress τ is applied on plane A–A in Fig. 12.114b. Considering similarly at point A′ expressed by A′(σ, − τ) in Fig. 12.114a, the shear stress −τ is applied on plane A′–A′ with an angle π/2 − θ measured from the direction of the maximum stress σ1 in Fig. 12.114b. According to internal friction theory, planes A–A and A′–A′ will become sliding planes. where we write T1 for the temperature in the region x > 0 and T2 for the temperature in the region x < 0.
where U2, V2 and W2 are the velocities of water at z = h in x-, y- and z-directions, respectively. W2 = 0 is satisfied if the tire is assumed to have a blank tread. Furthermore, V1 = 0 is satisfied on a road surface (z = 0) when lateral sliding does not occur. W1 = 0 is also satisfied on a road surface (z = 0), because there is no water flow in the z-direction if water flow is not disturbed on the smooth road surface. where the term in [·] is zero because it is the vertical component of the water speed on the tire and road surface. where ρ1 is the density of ice and c1 is the specific heat capacity of ice. where k2 is the thermal conductivity of the tire, ΔT2 is the temperature difference between the contact surface and the tire, ρ2 is the density of the tire tread rubber, and c2 is the specific heat capacity of the tire tread rubber. where Fz is the load applied to the tire, μ is the friction coefficient of the tire on ice, and Vs is the sliding velocity. where τ is the shear stress and η is the viscosity of water.